Phew!! What a crazy summer!! As you might have guessed from the title of this post, it has been one crazy summer so far. With the graduation of my eldest son, and not one, or two, but three shows going on at the same time, there’s been precious little time to breath let alone post!! LOL In the last month I prepared sets for “Little Mermaid”, “Avenue Q” and “Urinetown” two of which went into tech the same day, and had to be struck the same day!! Phew!! 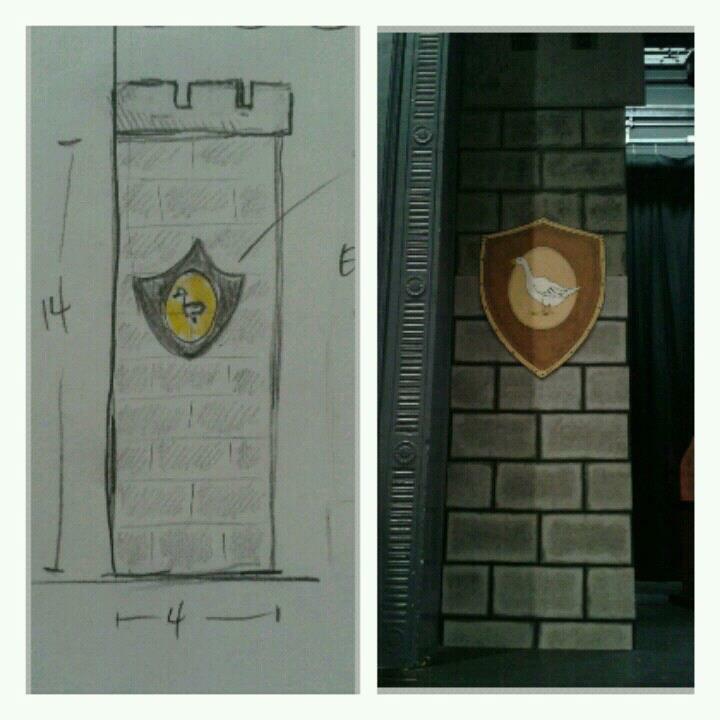 I still have “Urinetown” on the stage, but Monday morning we’ll have that down and I’ll take some time and throw together the information regarding the new pieces that I made for these awesome productions!! From all of the super helpful feedback that I have gotten, I can tell that you have missed me terribly, and I’ll get started on the new stuff ASAP!! LOL Thanks for stopping by!! Having completed these few projects as practice, I felt confident enough to do a project that had been running around in my head since Christmastime. 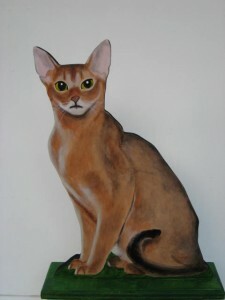 I wanted to paint a portrait of a cat that we had when my wife and I were first married, but had to adopt out due to the allergies of our first baby. We had initially adopted our “Moe” as a hospice case as he wasn’t expected to live out the year due to an ear issue. He was so little, and loving that we fell in love with him immediately, and he us. Everyday he did something to let us know how much he appreciated us and how much he loved us for taking him in. But when our first baby came, and was also allergic to him, we had to decide who was going to go. Now, as our first baby suffered from daily belly pains (Colic) and cried almost constantly, it was up in the air for a while whether it was going to be Moe or the baby going to my wife’s parents house. Ultimately it was Moe that got sent away, and even though he was still officially in the family, it really broke our hearts. When he moved to my in-laws, he was already three years beyond his life expectancy, and lived happily for another seven years with them!! He survived on love that he received, and gave. He was truly an extraordinary cat. I found a picture that looked just like him, and made this painting of him so that we could have fond memories of a cat that was literally our first baby. There was no doubt that this image would never be available for sale as it looks identical to Moe, and would have a spot in our home forever. 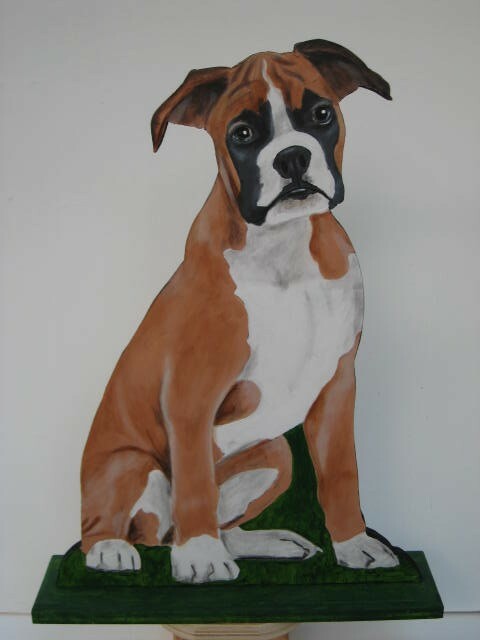 Right now he sits next to our TV stand, but when I initially painted him, I sat him on the front window sill where he would sit all the time when we had him in life. 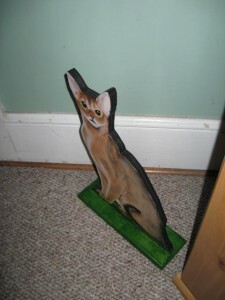 He doesn’t take up much room at all due to the fact that he’s painted on 3/4″ plywood and secured to a base that lets him freely stand wherever I decide to put him for the day. While we only have had his image in our house for the last week, it has been nice reminiscing with our children about a cat that we loved, and loved us back long before they arrived. Contact me at forensicartctj@aol.com if you would be interested in having a memorial cat or dog of your own. 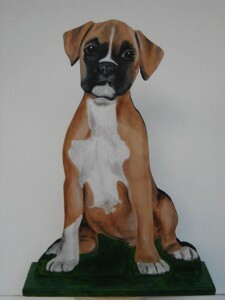 I have decided that I’ll do cats and small dogs for $350.00, and larger scale dogs (24 inch max height) for $525.00. 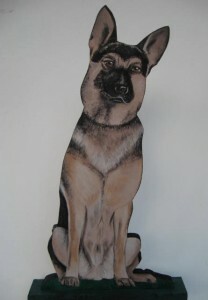 This is a side by side of the image that I did my first portrait from, and the freestanding 24″ tall, approx. 19″ wide “Forever Rebel” that I made for a friend. I’m so glad to be able to do this, and I look forward to hearing from you. Thanks for stopping by. Well, as it turns out, set building has left me with some down time that I had not anticipated. I really thought that I would be able to fill all of my waking hours with all the set building that I had been doing while working a rotating shift, but that just has not been the case. 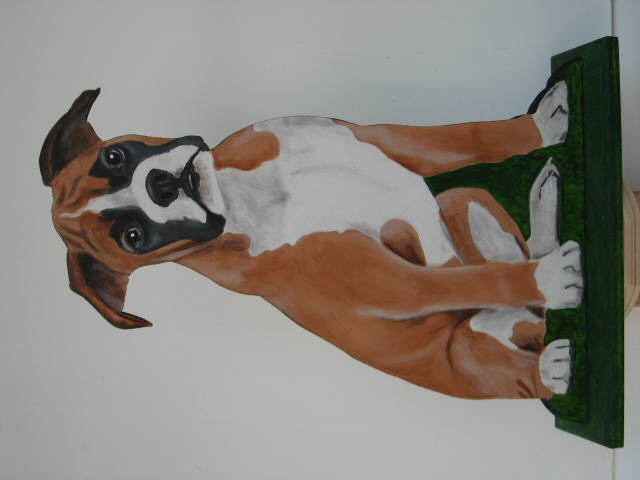 I decided that it was time to expand the services that we offer here at Magic Time Stage Craft to include animal portraiture, but in a way that I don’t see offered anywhere else. 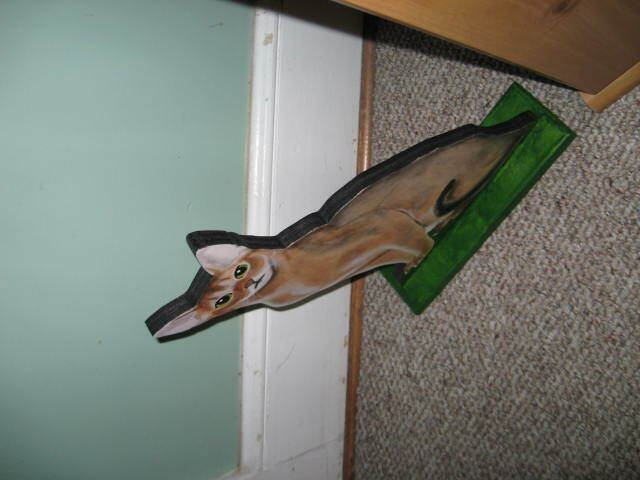 During the Christmas season of 2012, I was making wood cut outs of animals for a friend to paint for her family and friends, and one for her to paint for one of my co-workers when she said, “I’m glad to have the business, but why don’t you paint this yourself?” Well that was quite a good question. The answer at the time was that she had painted all of the other Christmas ornaments that I had cut out for that same co-worker, so as a matter of visual continuity, I wanted her to paint the last piece as well. 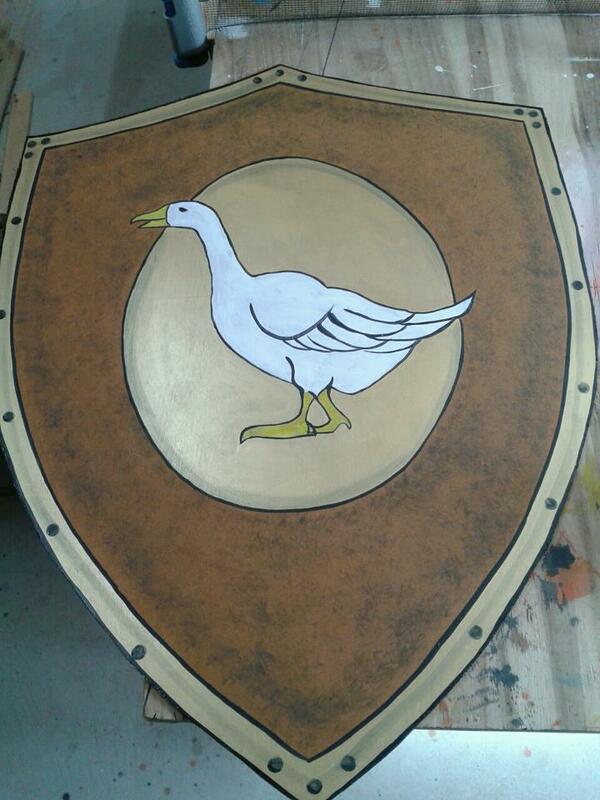 But after that, there really was no reason why I wasn’t making my own cut outs and painting them myself. So on May 17th, I decided to try a whole new thing and cut out a German shepherd shape, mounted it to a base, and painted it!! 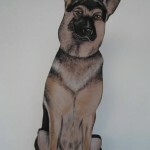 My daughter named him Buddy, and he is now dog#1 and the official guard dog of by shop!! 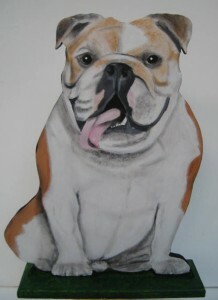 The idea of doing this had been sloshing around in my my for several months and as a result I had already compiled a list of dogs that I wanted to make painting of, and soon after Buddy was done I got started on Rufus. I love English Bulldogs, but I am not a real lover of the drooly dog types, so this is as close to the real thing that I’ll ever own. 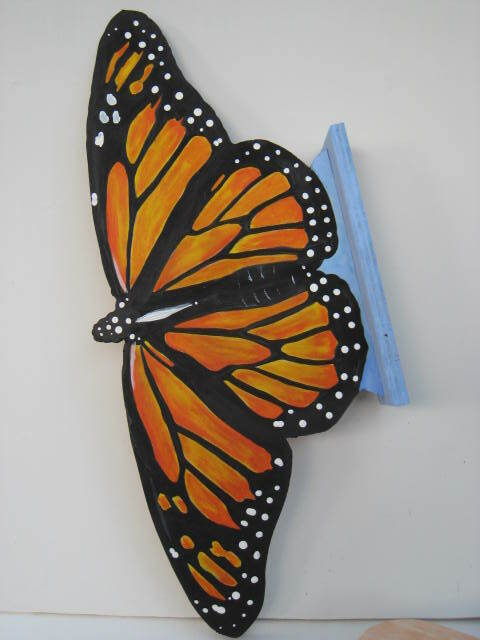 It occurred to me that I could do these with almost any image and one day after Rufus was done, I decided to try a Monarch butterfly. I wanted to really try and catch the brilliance of the colors in the wings of the image that I was painting from, and think I really pulled it off!! 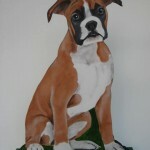 The next up was a challenging, wrinkly, multi colored Boxer that ultimately became known as Boots. Now considering the fact that these are my first real forays into the world of painting with color, I felt pretty happy with having gotten close at all. It was a bit frustrating at first, but the learning process has developed from frustrating, to a fun daily artistic challenge. 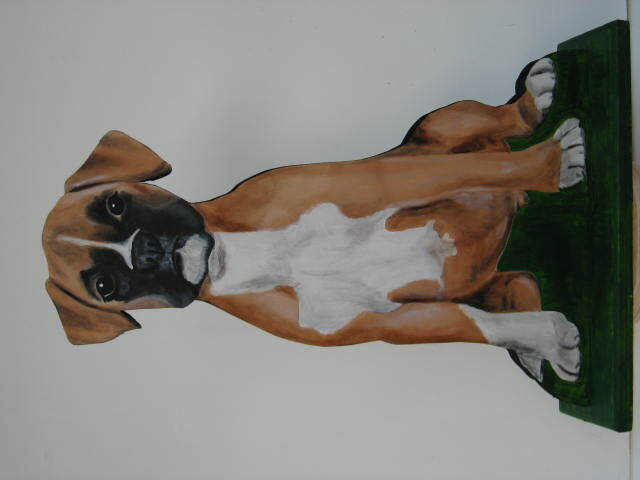 My next challenge was a puppy that I found irresistible, and I really spent some time trying to get all of the nuances of the colors right on this one. 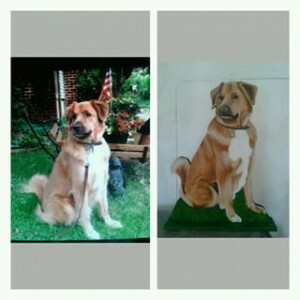 I was thrilled with how he was turning out, and when he was finally done, many people were sure that I was posting a picture of a real dog!! 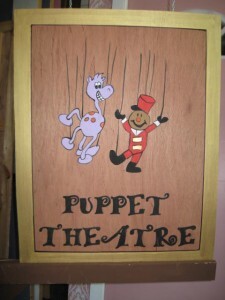 What artist isn’t thrilled with hearing that, let alone one that makes art for the stage!! I was very pleased. 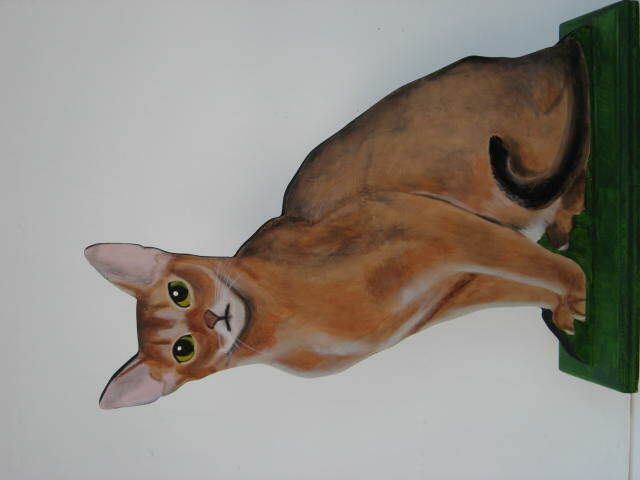 In my next post I’ll discuss a cat that I painted in the image of a cat that we loved dearly while we had him, and how I’m dealing with the requests for images that have started rolling in!! Thanks for stopping by. Well, I have been putting off this post for a while now due to the fact that I’m not really sure that I’ll have much to post about when it’s done. I intend to make a weekly post, but everyone knows how that goes. I look forward to posting all the new stuff that I do, but with the crazy summer season coming, I’m not sure how its going to work. 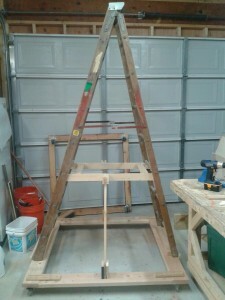 I have recently built some awesome escape stairs that I’ll be using in a summer show, but I’m hesitant to post them until after the July production. I’m also probably going to start making posts regarding the development of my “regular art” and how I have developed there as well. It’s actually bee a lot of fun, but as always I’m still learning new techniques and tricks, and trying to get better at techniques that I have already tried. Anyway, the latest production that I’ll be posting about is our Community Theatre’s production of “Fiddler on the Roof”. As my retirement from my “day job” was scheduled to fall right in the middle of the run, I said that I would not be in the cast, that I would build and be on the crew if needed, but being in the show might be to much. After a small male turnout, the director contacted my wife and said that she needed men for smaller rolls. I said that I’ll do something small, and got cast as Avram the bookseller. This would be my first experience with a beard and mustache, and having had the experience, would be my last as well. 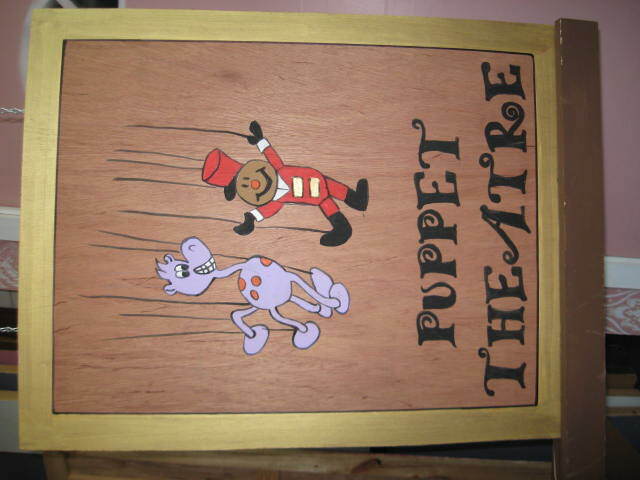 The director purchased the plans to the set used in a production of the show done in a Philadelphia Theatre, and I reproduced them to the best of my ability. 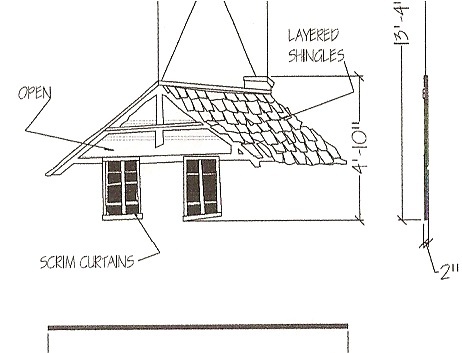 The pieces as drawn were flats, built to appear dimensional, so each individual piece of cedar shake roofing had to be shaped before it was placed on the flat. 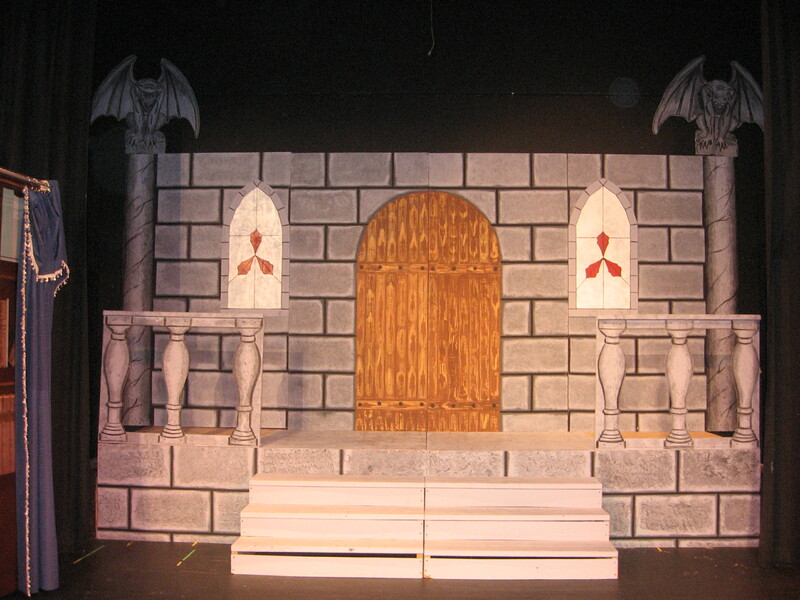 I built the all out of 1″ x 3″ lumber, but the widows separately and added them after being transported to the stage. 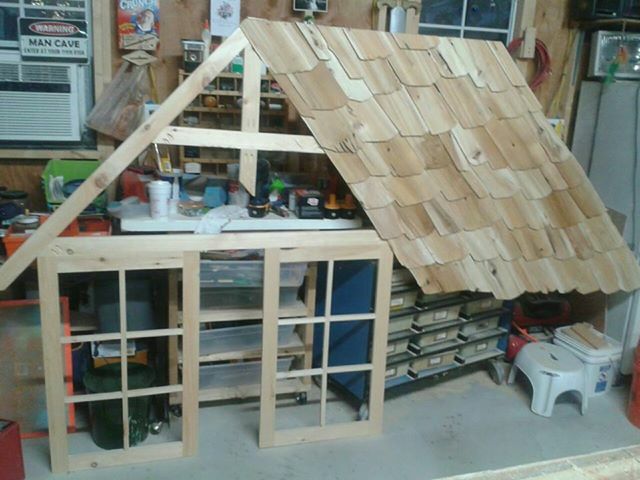 This is a picture of the four roof pieces that I built, along with a back drop that the director rented, and wood drops that are stock at our theatre. We are very lucky to be able to do our shows on a broadway grade stage with a full fly. 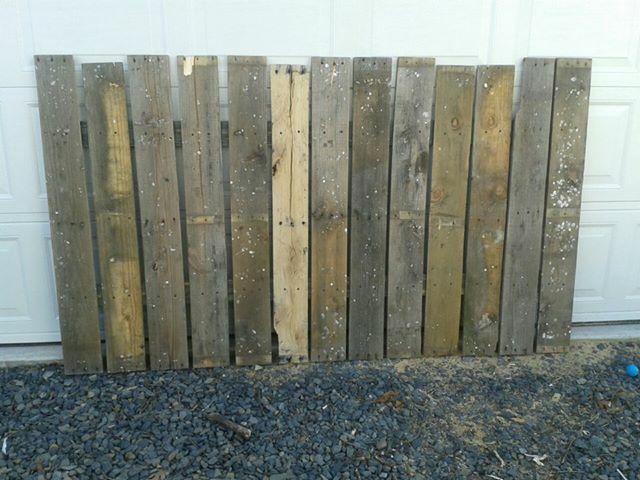 The next thing that I did was make some fence pieces out of old palates. In the process of this, I discovered that taking apart old palates was back breaking work, and no amount of properly aged wood was worth that amount of effort from this fat guy!! Having done all that…it was on to my “Fruma Sarah” rig. 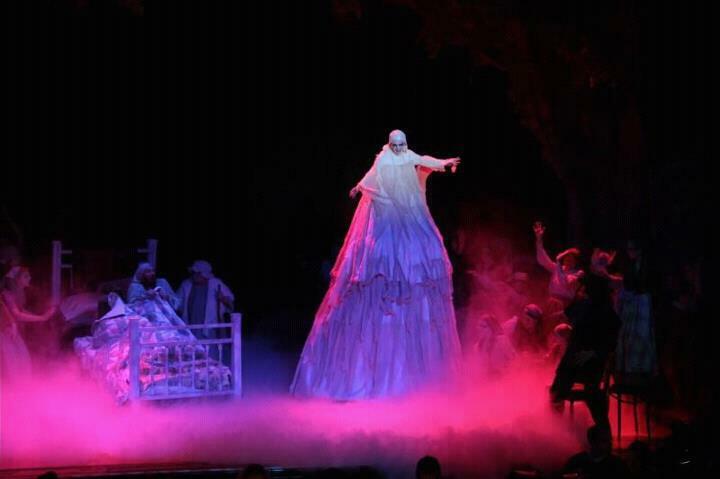 Fruma Sara is the ghost of one of the character’s dead wife, and to be effective, needs to be larger than life. To be larger than life our actress would be standing on an eight foot ladder (that I trash picked) secured to a dolly with roller blade casters that I got at Harbour Freight. The rig was turned over to our awesome costume people who successfully made old Sarah look both beautiful, and scary at the same time. For this show, I developed in so many ways. This was the first show that I had professional drawings to build from, and if I’m being perfectly honest, I found it a bit limiting. 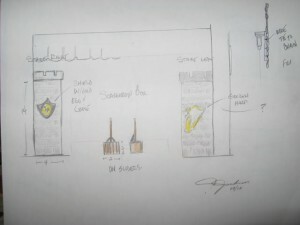 Over the last five years I had grown accustomed to building off the cuff from rough sketches. Nightly, I watched Fruma Sarah do her thing on the stage fearing all the time that the actor rolling her around would run her right off the edge of the stage. Fortunately that was a fear of everyone involved so we took great care to avoid that. 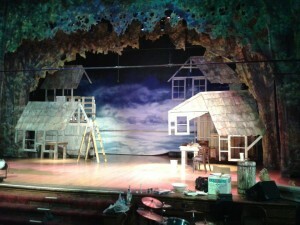 I successfully retired from a 25 year career, and started a new chapter in my life, and hoped that designing, building and painting for the stage would be a big part of what kept me out of trouble with my wife. I expect that I’ll be posting about the stairs I mentioned earlier because they are an exciting addition to our set foundation collection, but we’ll see!! LOL Thanks, as always, for stopping by!! Now that I am down to two show left to write about, I’m curious if there’s area any topics that you would like me to expand on? 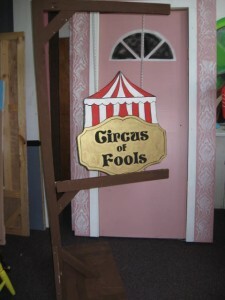 I have written about a lot of things that I have done in the old traditional methods as well as new methods I believe make the job of getting a set to the stage for our kids and residents alike to act, and enjoy themselves on. With that goal always in mind, I believe that I have already, and regularly enjoy a good measure of success. I suspect that I’ll be covering in more detail some of the techniques that I used to get bricks, blocks and wallpaper painted onto flats, but I’m just not sure yet. I haven’t gotten a whole lot of feed back regarding anything that I have written about to be sure that it would be interesting to anyone. We’ll see. For now, I want to post about out Youth Theatre’s Spring production of “Jack and the Giant”. Having gotten a preliminary list of the directors “wants” for this show, I knocked out some simple sketches to show them what I had in mind for the pieces that they asked for. 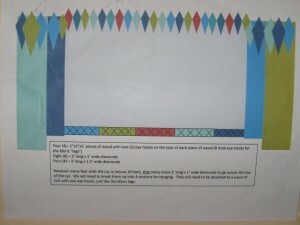 With another huge cast, they didn’t want any significant levels, but did want something that some of the smaller the kids could stand on to be seen. 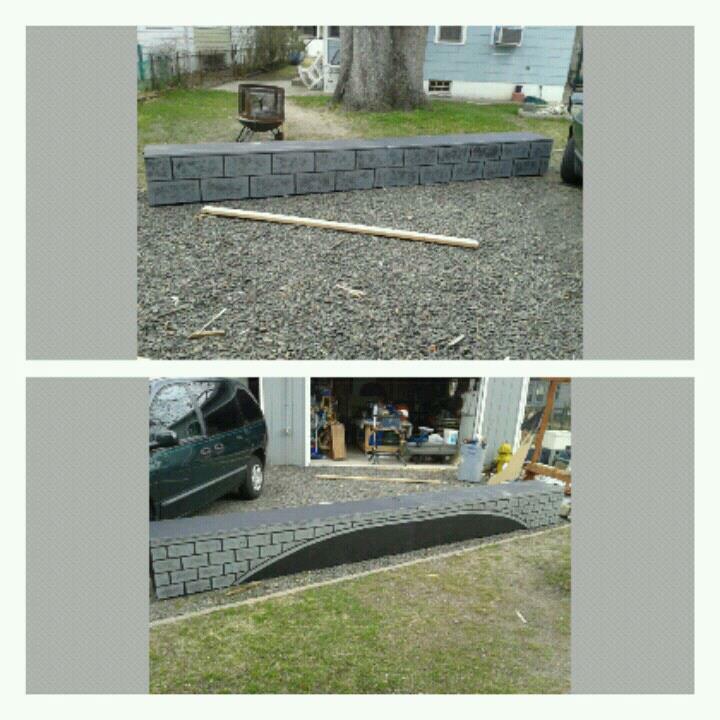 I suggested that since they wanted a ”small bridge”, that we paint it on the side of two of the decorative boxes left over from the High School’s musical. 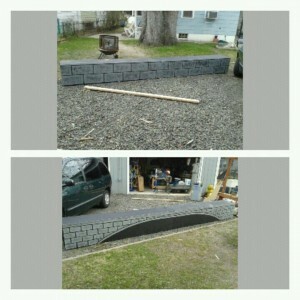 I painted a simple stone block wall on one side, and the foot bridge on the other side. To hide some of the cast while they were setting them for scene, I suggested that they use castle themed proscenium pieces with a shield on one side, and a golden harp on the other as seen in the initial drawing. 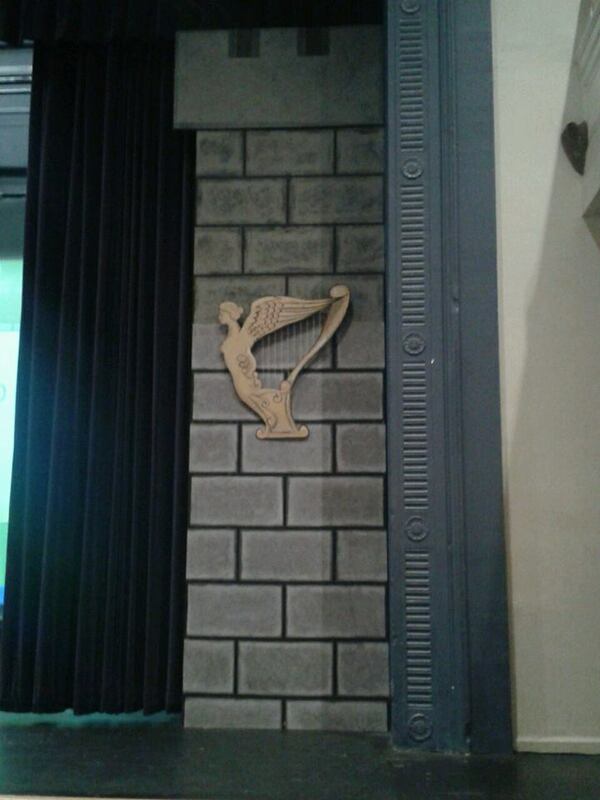 This proscenium piece was 15 feet tall, and at the request of the directors, the shield and harp were removable for the first act citing a concern that the audience would be distracted by the fact that the whole show was being done in what appeared to be the Giants castle. 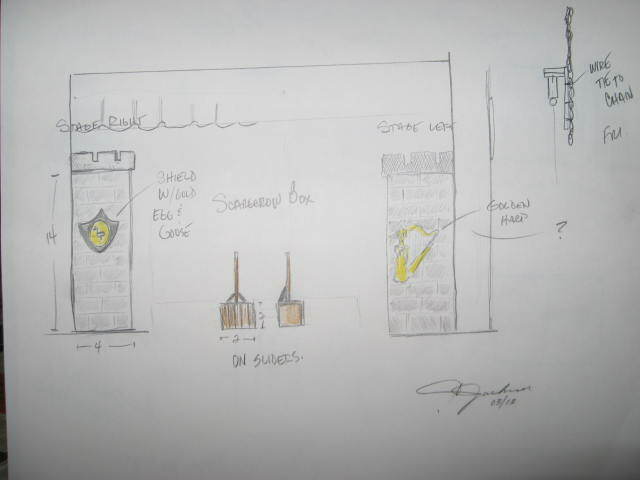 For the castles interior though, the needed a baking oven that had the ability to hide Jack from the Giant. So I built a nice sturdy oven, with a sturdy door, and put it on a 2′ x 4′ platform deck on sliders. 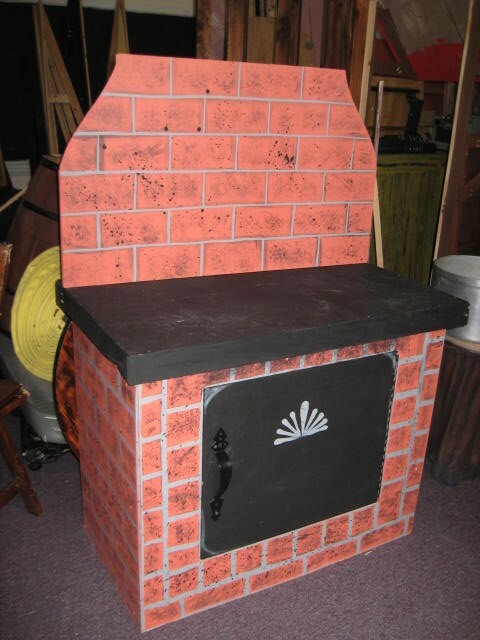 I did the bricks on this completely differently that I had done the window unit for “Thoroughly Modern Millie” and initially didn’t really like it, but it grew on me. It’s a little more time consuming to do it this way, but I actually liked it better after a while. 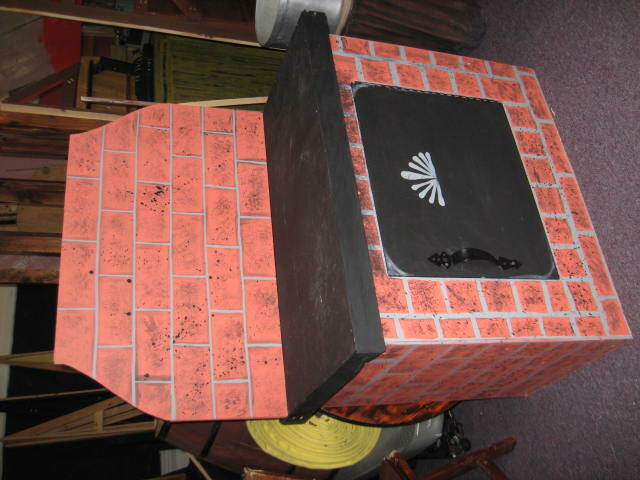 From the audience it looked like a real brick oven. I was also quit pleased to have gotten these painted doors a bit more work against the upstage wall in the giant’s castle. This would only be their second show, and once again they served quite well. 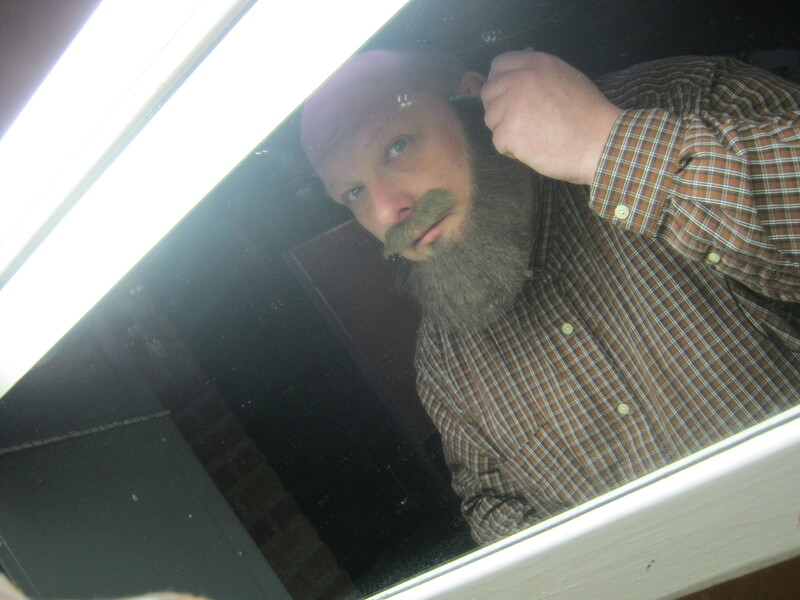 In my next post I’ll be writing about the set pieces that I build for our Winter 2013 production of “Fiddler on the Roof” in which I was cast as “Avram” even after specifically stating that all I wanted be was a villager that minded hi own business!! Thanks for stopping by. She said she just wanted 24 12 inch diamonds for across the back of the stage, and then 12 24 inch diamonds for the four mid stage legs. I advised her that 12 inch diamonds would be barely visible and suggested that we make the smaller diamonds 36 inches, and the bigger diamonds 48 inches. She seemed reticent, oh yes she was reticent, but when I showed her what the diamonds would look like in the sizes I had suggested, she agreed that the larger sizes would be more appropriate. 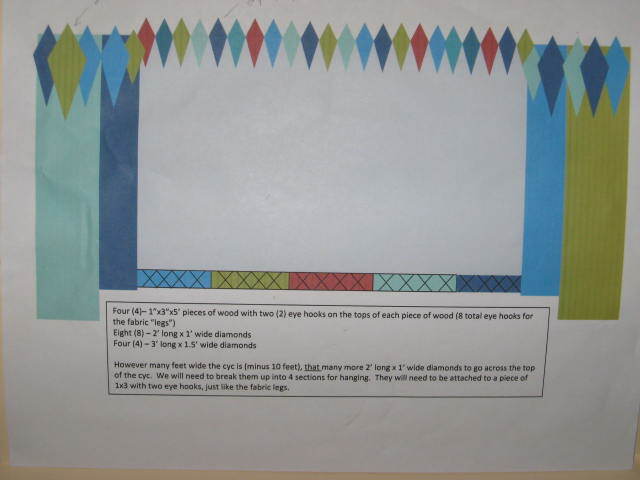 The initial drawing that she threw together called for a single row of diamonds, but as things will happen, she liked how they looked while the initial 24 were drying after painted, she changed the pattern design and needed another 24 of the smaller diamonds. The same thing happened while the larger diamonds were drying with some of the new small ones. The design changed, and she needed yet another 8 small diamonds. This “easy” set was getting to be a lot of work. With the new pattern for all of the diamonds, a new mounting system had to be designed. 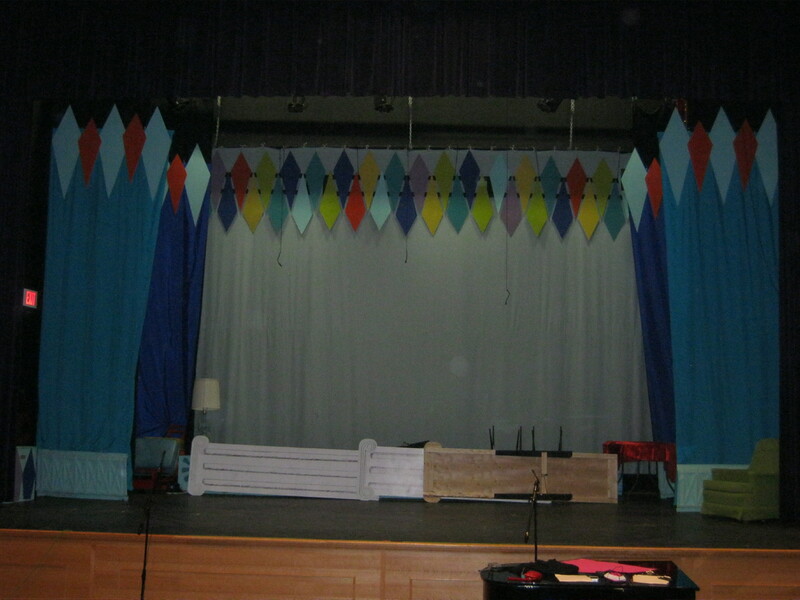 A simple 8′ x 18″ three toggle frame was the answer for the upstage diamond, and 48″ x 18″ frames were fine for the mid stage diamonds with the fabric. Once the diamonds and fabric were mounted to the frames, it was time to start thinking about rigging them for hanging. 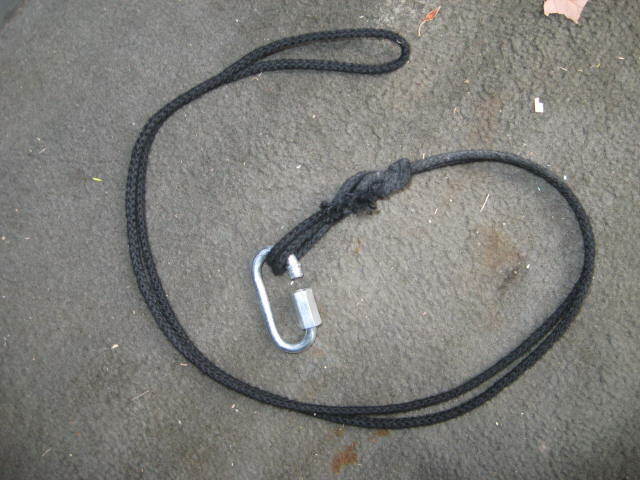 For the larger frames I just threw a bowline knot in a doubled over arms length of tie line, added a threaded carabiner, and wrapped it around the frame. As there was very little weight involved in any of the assembled pieces, the hung right up with no problems. For the down stage legs frames that were covered with fabric, I had to use steel d-rings on the back to fasten the tie line, but used the same tie line and carabiner set up as with the larger frames. 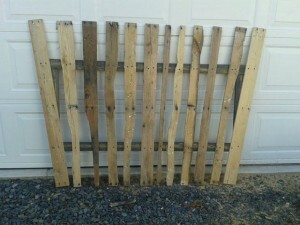 These would be a great addition to the tool box for getting stages ready for shows. Fortunately the “other show” that this director was doing at a different school was also “Bye Bye Birdie” so pretty much all the other sets and props were transferred from one stage to the other. In my next post, I’ll be writing about a show that I set up, and struck just last month!! Thanks for stopping by!! With this post, I’ll be writing about the last show that I did in 2012, and the next two will cover the first two shows of this year. I really thought that it would take longer than it has, and I have to say that I’m in a bit of a quandary as to what I should blog about next. 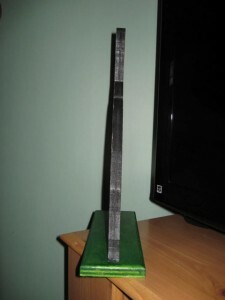 I have some fun options that include some of the art that I have made, and how I made it, or even some of the techniques I used for painting the scenery. I’m not sure, but I’m going to keep posting as I do new shows, the two comments I have received really demonstrate the wild popularity of these posts, so I’ll keep plugging away. 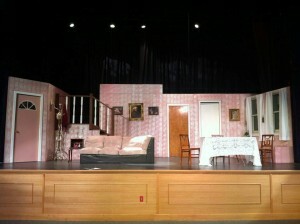 My last show of the 2012 season, was the High School production of “Arsenic and Old Lace”. This show required a static set that is simply the living room and dining room of two old sisters that, in doing Gods work occasionally poison and kill men they consider lost souls. 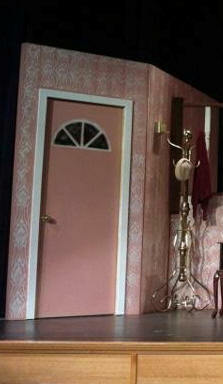 This would be the show that we say goodbye to Miss Hannigan’s door. This door had been in many shows since I build it in the Spring of 2009, but it was time for change. I needed a front entry door, and had a beautiful Stanley door for the job, but it was way to heavy for this set, so I re-purposed Miss Hannigan’s door. 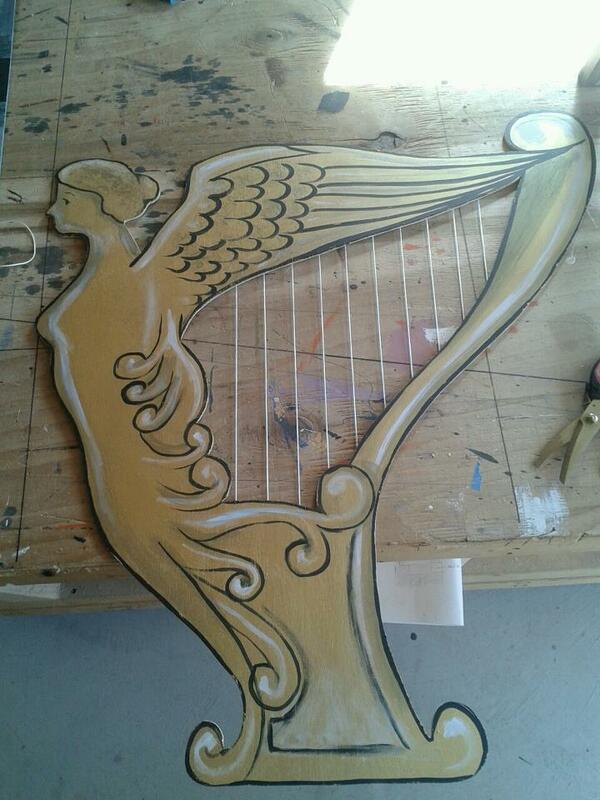 After a little bit of paint, Miss Hanigan’s door was no more. It was a sad day, but after this show, we have a nice looking front entry door. 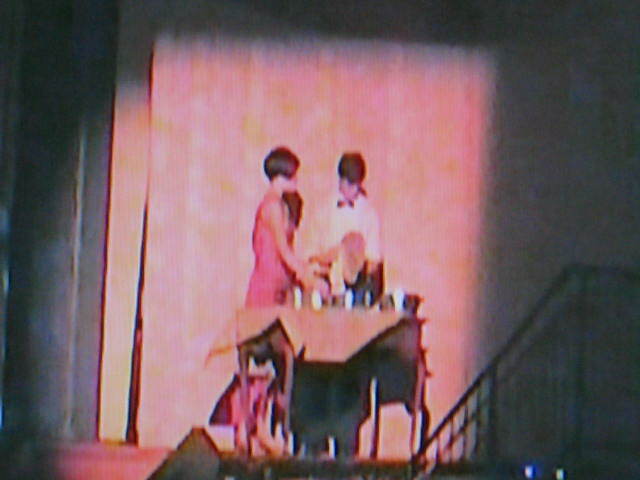 The pink paint I had used on the flats in “Thoroughly Modern Millie” was the color that I had planned for this show so that we could make the quickest transition possible. We had a three week window to transfer the set from Millie, to Old Lace, and one of those weeks involved the Thanksgiving break. The flats from Grayson’s office went right to the back wall next to the landing, and attached to the front entry door. This was my first static room set, and I planned the landing and stairs with wall flats in between, but failed to account for the fact that the platform I was using would represent half of the height of the flats so the extension that I used in the window flats for Millie, was re-purposed to extend the flats by the landing. It was a pretty simple, but effective set up that the kids really seemed to enjoy doing the show on. They had plenty of room behind the flats to get on and off stage, and really sold the direction to the basement and kitchen well throughout the show. 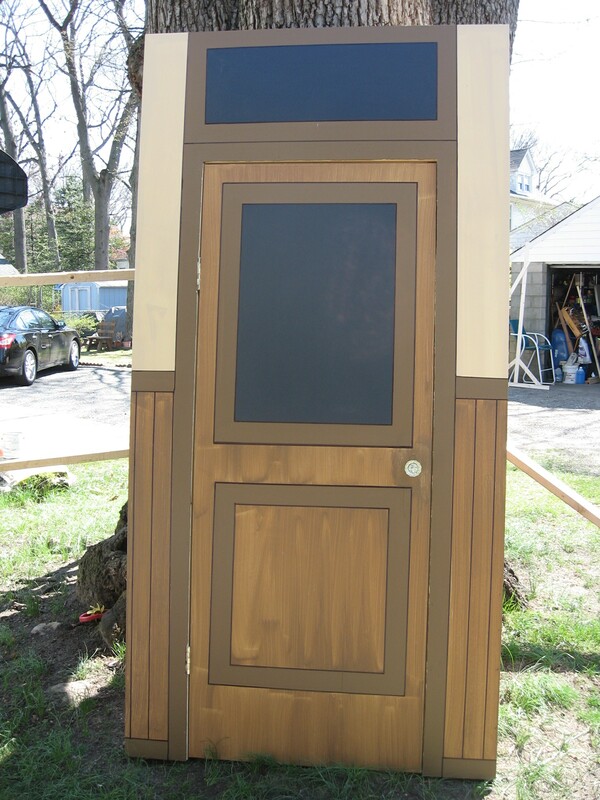 Having taken the basement door right off of the set of Millie, the only things I had to fabricate for this show was the kitchen door flat and a hatch in the top of the window box for bodies. For the windows I just painted over the bricks I had painted for Millie, and mounted the flats on the window seat that I had put the hatch in. 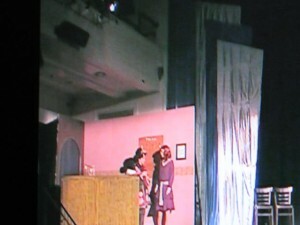 The window seat is a 24″W x 8′L x 18″H platform that I built for a 2009 private school production of Grease. When they couldn’t get two screws out of the top, they threw it out, so I grabbed it and have used in several productions since. 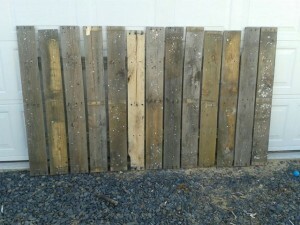 I just cut a hatch in the top for this show, framed out the hole, replaced the cut out and screwed on a piano hinge. It was a set that I had very little time to get on the stage, but as I had planned for the transfer of the set from Mille to Old Lace, it went very smoothly. The kids really knocked this show out of the park, and really seemed to have a good time on the set. 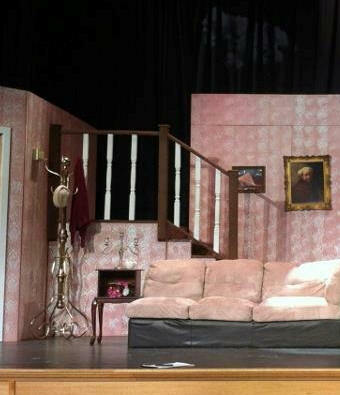 In my next post, I’ll be presenting space saving sets that we flew in and out for our Community Theatre p[roduction of “Fiddler on the Roof”. Thanks for stopping by. 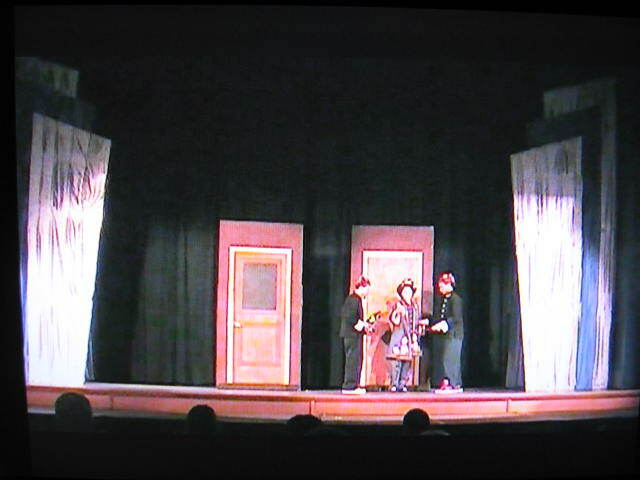 Usually a production of “Thoroughly Modern Millie” calls for several doors for the hotel scenes, but the director for this show only wanted two for this Fall Middle School production. I actually have several doors handy, but only two were the same size. I put both on 2′ x 4′ rolling dollies using my new hockey stick supports. I found that they were more appropriate for a door installation due to the height and weight of the flat, and offered more stability than a traditional triangle would have. This particular director as I have said before, liked to get the kids involved with the painting, and they painted the door flats. 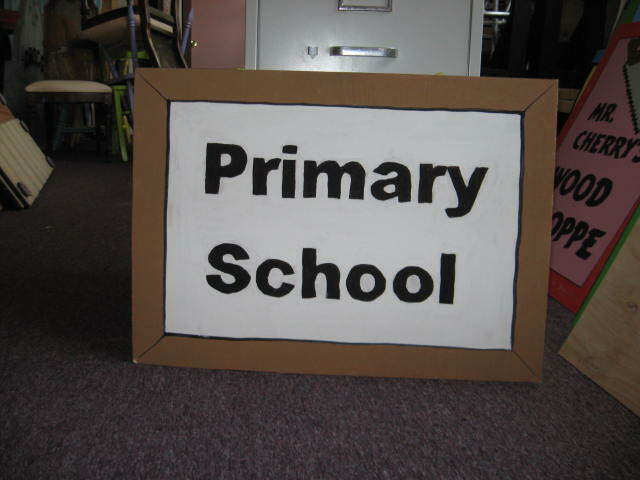 Turned out though no one wanted to be the one that put new paint over Miss Hanningan’s door paint. So it would stay Miss Hannigan’s door for the run. For the hotel office, I re-used the desk that I had made as bar for “Guys and Dolls” , and re-purposed a section of the Mother Tree from “into the Woods” for the archway. 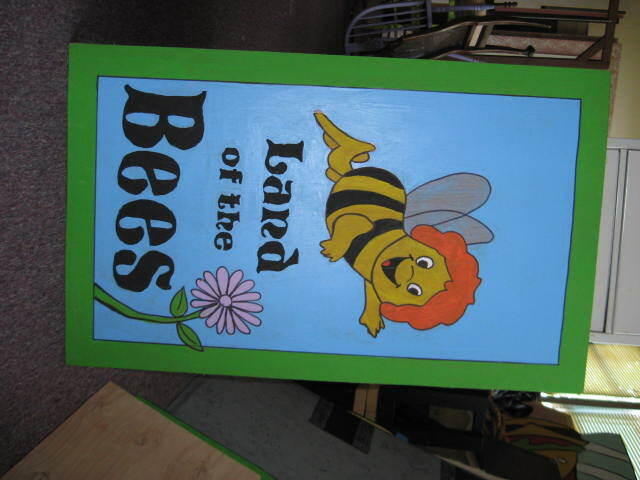 It was supposed to be repainted but the kids that were detailed to the assignment forgot about it, and by the time I noticed it, it was too late. 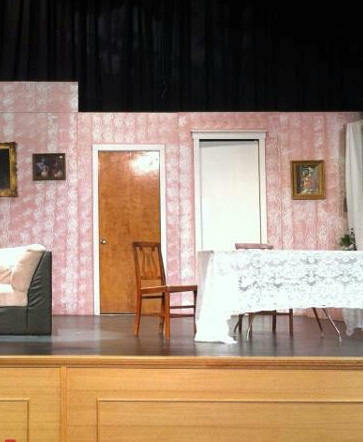 The back wall of the office is three 4′ x 8′ flats painted over in a pink that would dominate the set of the show that I was getting ready for next. With the High School play on deck immediately after the Middle School musical, I decided that any time saving measures that I could take, I did. 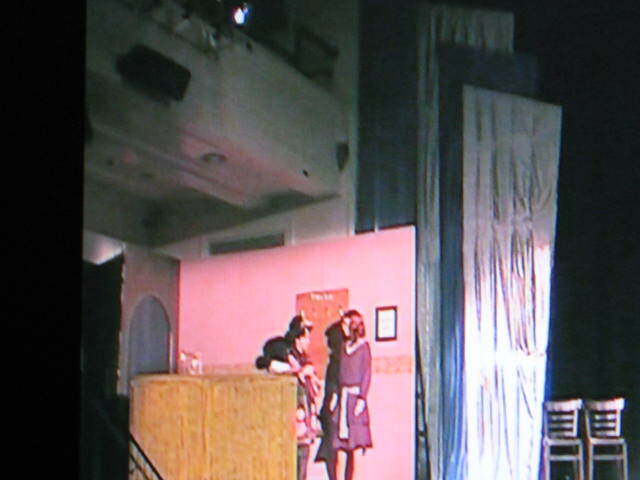 So all the “Wall” flats I used for this show were base coated in pink. The office walls were left with just a taped on border, but for the flats that I used for Grayson’s office, I got a new tool that I was very excited to try. 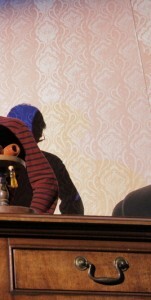 I had wanted to try a pattern roller for some time, but hadn’t really needed to invest in the tool until I needed “Old Lady” wallpaper for the High School Production of “Arsenic and Old Lace” scheduled for three weeks after Millie. 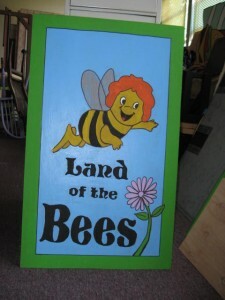 It was great to be able to have three of the flats already “old ladied” up, so the transition would bee less of a hassle. The pattern roller really added a nice texture to the plain pink walls and successfully made the setting on either side of the stage look unique even though they were the same color pink. The pattern roller was a bit expensive, but was well worth the investment. It’s a bit hard to maintain, and does appear to be wearing after what I consider only a few uses, but as long as I can get a few years use out of it, I’ll be happy. In my next post, I’ll be covering the transformation of one of my oldest, and most popular set pieces. Thanks for stopping by. 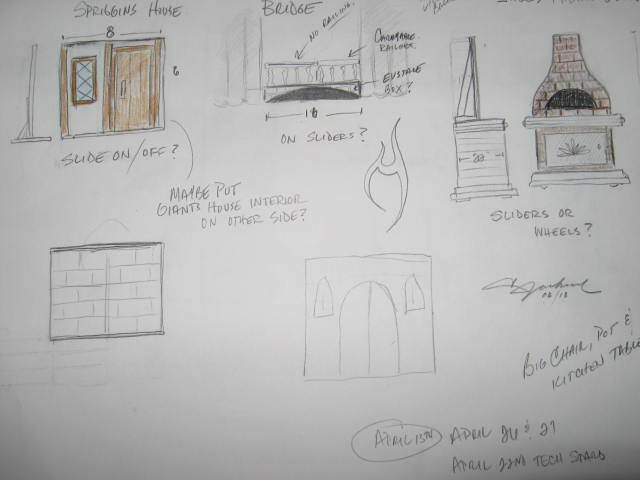 Since March 20th, 2013, I have been making an almost daily blog post regarding my development as a local scenic designer, builder, and painter. I started as an enthusiastic theatre Dad, and over the last five years, have developed skills and abilities that surprise even me. Am I headed to Broadway, or Hollywood? Nope, not anytime soon, but I have developed ways of making sets for the stage that have certainly made getting the job done more easy for me. I know there are other theatre Mom’s and Dad’s that could benefit from my experiences, but more accurately my mistakes. Over these few years, I have striven to make what I was doing at the time faster, easier, less expensive, re-useable, and more easily stored. I believe that I achieved a level of success that again, has surprised even me. I am very proud of the accomplishments that I have made, and just as in the beginning of this “blogging adventure”, I wonder how on earth I was able to get it all done. In the time that I was able to do all of the things I blogged about, I also worked a shift that rotated days to nights every two weeks, did all of the usual soccer Dad stuff, maintained a house, had a new garage and and new kitchen installed, and still managed to get sets and/or props designed, built and/or painted in 35 shows up to and counting our Middle School production of “Thoroughly Modern Millie”. While Millie marked a milestone in my scenic career, my arrival at this show also marks my arrival at my 50th blog post. Even though it appears that no one ever reads them, I get a thrill with each time I push the button to “Publish” a post. I never envisioned that I would be someone that wrote 22,000 words about anything, but here we are. I think what I have done, and how I have done it is an interesting story, and I’m hoping that others do as well. So…having now said all that, on to Millie. 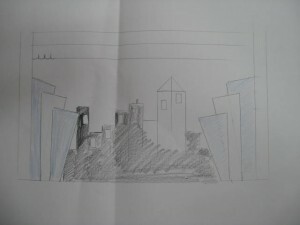 As has become my habit now, and being flash inspired by my director when she said the words “Art Deco”, I made a quick sketch of what I thought the proscenium pieces should look like. 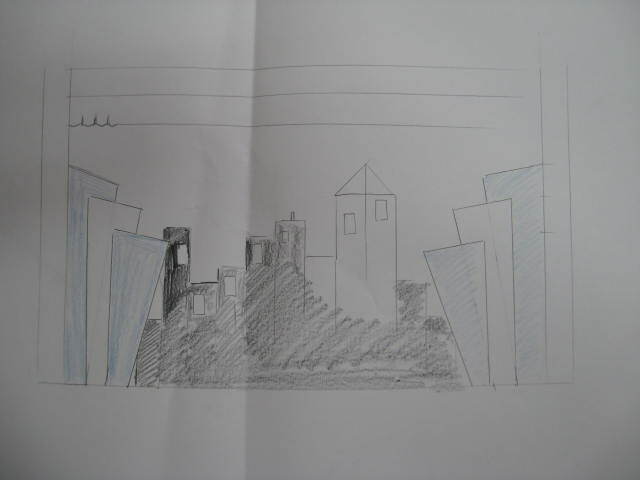 Of course, as I usually do, I initially went a bit big with the image, and didn’t really think it represented what I was thinking about and would take some very distracting explaining to the director I was working with. So I did a more to scale proposal image. 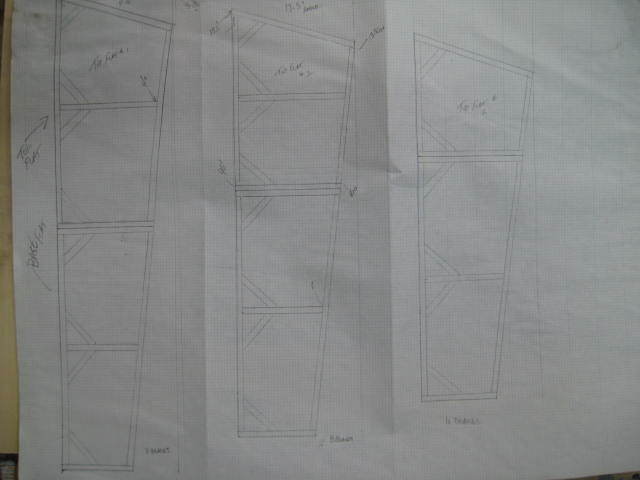 I said that I wanted the Proscenium pieces to be 16, 14, and 12 foot flats set up against each other after being covered with shiny or sparkly fabric. I threw on what the side scenery might look like and when they idea was approved immediately got started on the complicated angles build. 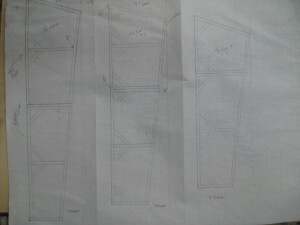 These are my initial drawings, and if you notice, there are no measurements on it. I just went ahead and designed them using the measure of “that looks about right” and figured it out later. Of course, not being all that math oriented, and usually thoroughly confused by angles, I did the math wrong and wound up with three pieces per side that were 16/15/ and 14 feet tall. I think they ultimately turned out looking great, but were quite a draw on the old 1″ x 3″ wood pile on something that I would very likely have a hard time incorporating into another show anytime soon. 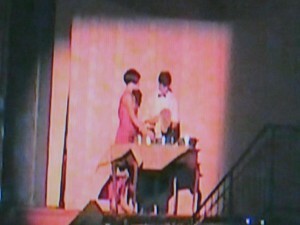 With my daughter sharing the role of Millie though, the investment of time and lumber was certainly worth making. In my next post I’ll continue with Millie, and demonstrate what design elements of this show I used to make the three week turn around time for the next show a bit easier to handle. Thanks as always for stopping by!! At this point in my second career, I have started to develop as many time and money saving processes as possible. 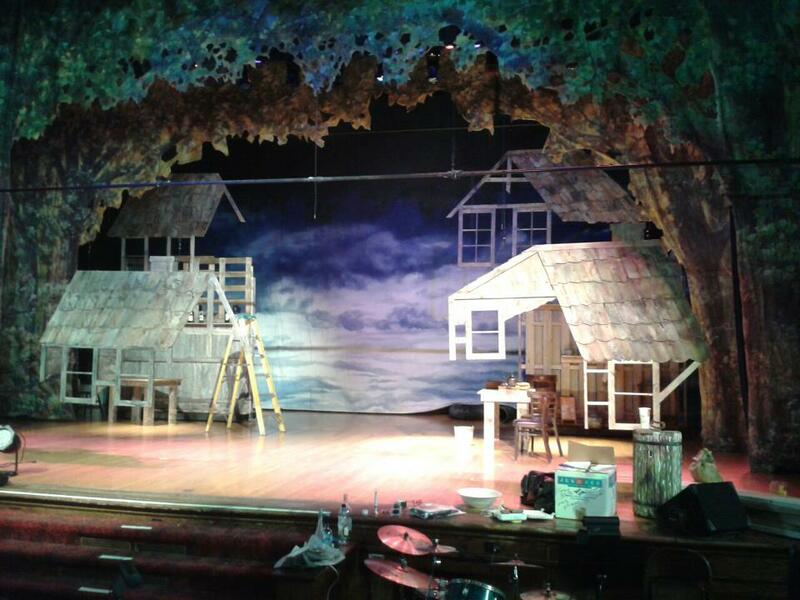 The colors I used on the “Into the Woods” set, would be the colors scheme that I transferred to the set of out Youth Theatre’s production of “Pinocchio”. I left the foundation levels for “Pinocchio” in an area adjacent to the stage after the strike of our Middle School Musical so I didn’t have to schelp that back and forth from storage. 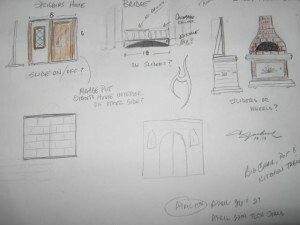 I have yet to develop the ability to organize my thoughts, and plans in a way that minimizes my “back and forths”, but I’m always trying to work on that.With three of the four six foot flats that I would need for “Pinocchio” rolling around on the set of “Into the Woods” I just had to get started on the stuff that I would have to fabricate for this summer show. 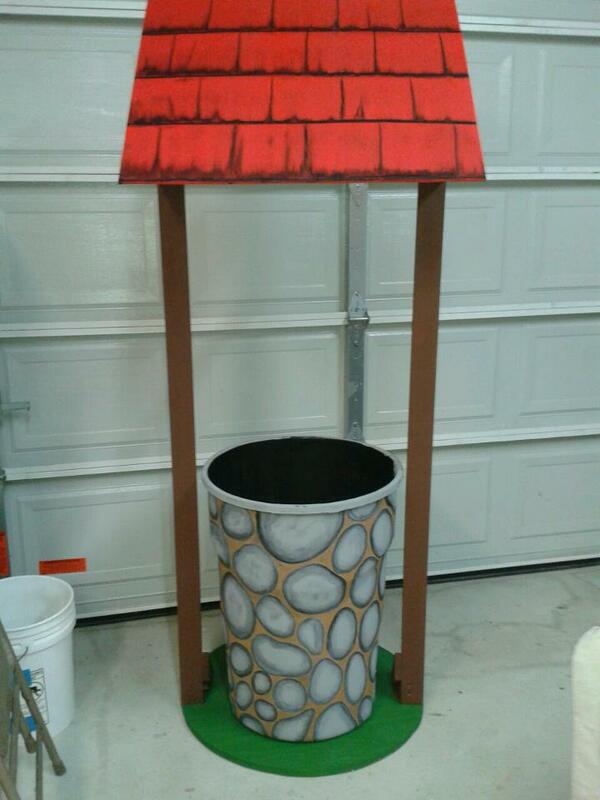 I started by re-purposing one of my newer trashcans into a wishing well. 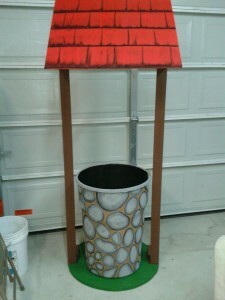 As usual, the paint on the trashcan was temporary due to the fact that even the scuffed plastic simply didn’t want to hold onto the paint, but it would be fine for the run of the show. 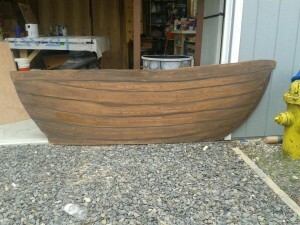 The next thing I made was a boat. 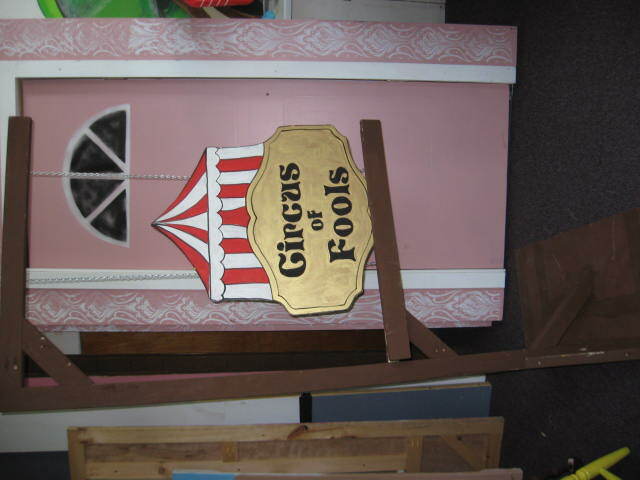 This was an item that we did have in the Youth Theatre storage space, but it was so badly beaten and rotting, I decided that a new one was called for. 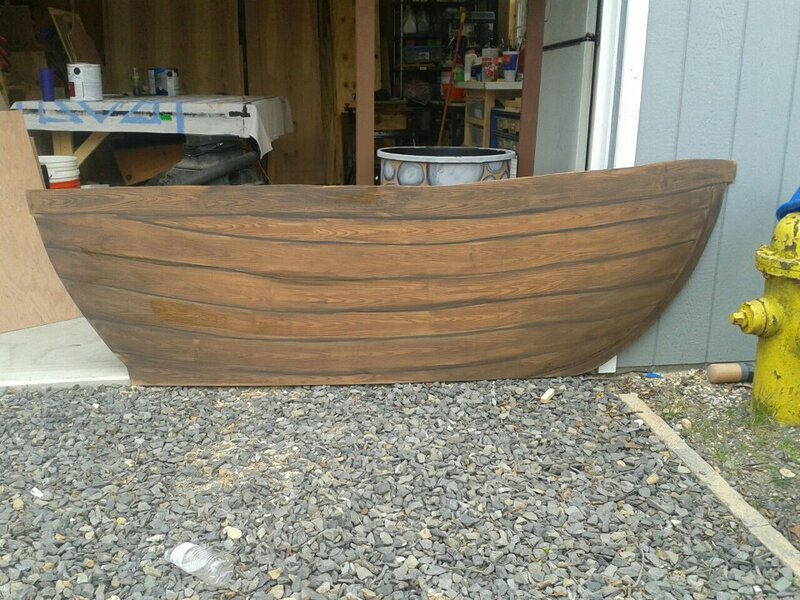 I was happy with the shape, and wood graining on this boat, but I was a bit disappointed with how the planking appeared at the back of the boat. With time getting crunchy though, I’d live with it. Another thing I have had to battle in all of this development is dealing with what “I” liked, and what the directors would think is fine. 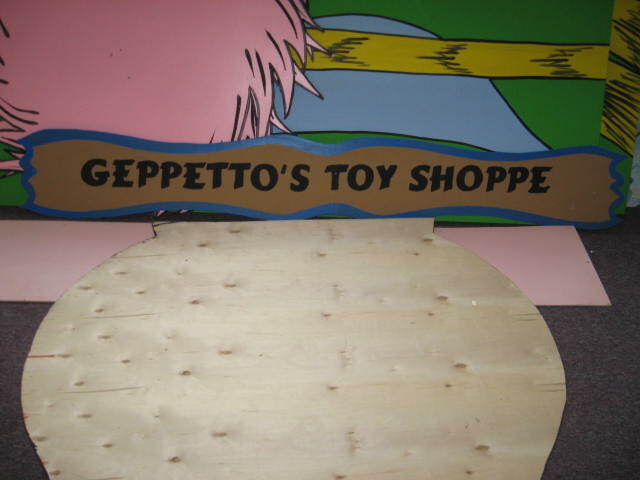 For Geppetto’s Toy Shop, we just brought out the house that We’d used in two other productions, and slapped this sign on it. It really looked great. For the scene changes, the director wanted an old fashioned type scene change card holder, with cards that indicated what scene was going on. 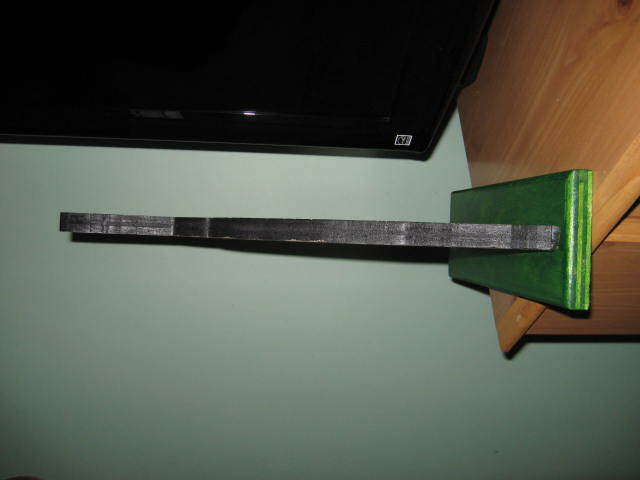 For that I made this “Easel” that when supporting a sign made it look like the sign was hanging from a sign post. This made the sign changes simple and fast. All of the signs above were used for the scene changes. 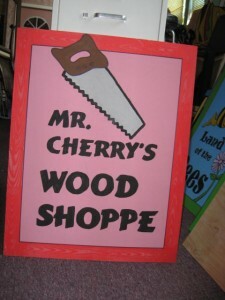 Have I mentioned lately how much I hate the tediousness of sign painting? 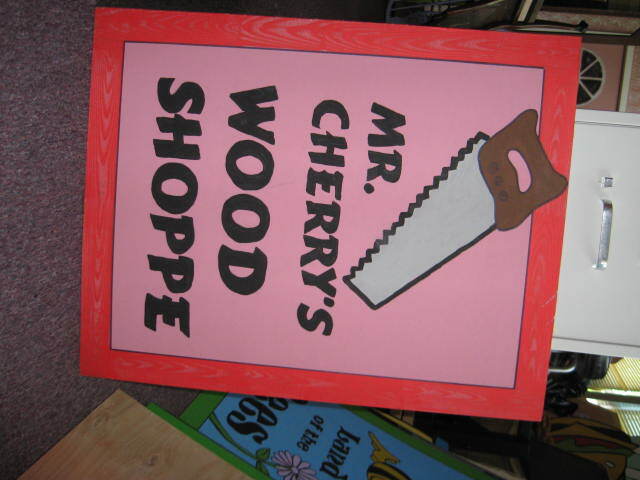 So for this little bit of unpleasantness, I went all Huckleberry Finn on my kids and told them that they would not be able to help with the sign painting unless they behaved. Needless to say there was almost nothing they could do that would prevent me from “letting” them paint the signs, but they didn’t know that . 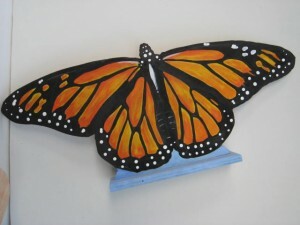 It was actually an activity that turned out to be quite fun as we all did it together on the workbench in the shop. After the summer of 2012 craziness was over, I was able to take a break, and just work my regularly scheduled job. The Fall craziness would start soon enough. 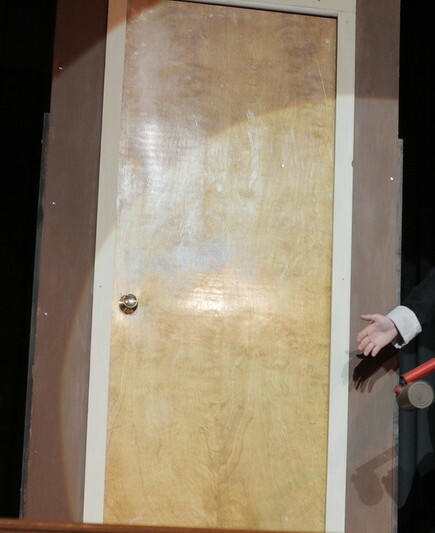 In my next post, I’ll cover how I start designing elements of sets for one show, with the intention of transferring those pieces to the next show, and we’ll also celebrate the end of Miss Hanigan’s Door’s stage career. Thanks for stopping by. Jessica Townsend on Phew!! What a crazy summer! !